No one in the White House questions the mental stability of Donald Trump, US’ top envoy to the UN Nikki Haley has said in response to an allegation against the American President in a controversial book, report agencies. 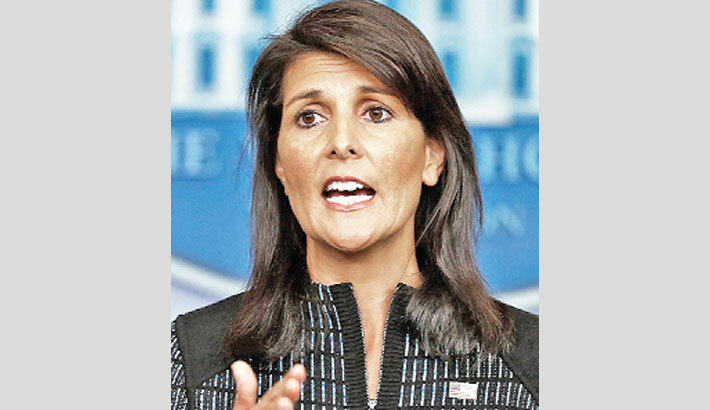 Indian-American Haley, the first-ever Cabinet-ranking official in any presidential administration, defended staffers in the Trump administration as loyal and respecting. Haley’s defence of Trump comes after the publication of the book titled “Fire and Fury: Inside the Trump White House” by journalist Michael Wolff, in which he claims to have interviewed more than 200 people familiar with the purported chaos inside the Oval Office. In the book, Wolff writes that people around Trump regularly question his intelligence and fitness for office. “I know those people in the White House. These people love their country and respect our president… No one questions the (mental) stability of the president,” Haley said yesterday. “I can’t vouch for anything like that. I don’t know if it was 200 interviews with Steve Bannon, or if it was 200 interviews with himself, but I can tell you, I know these people. I work with these people,” she said. Trump, 71, has repeatedly slammed the book as fake, describing it as “full of lies.” “Michael Wolff is a total loser who made up stories in order to sell this really boring and untruthful book. He used Sloppy Steve Bannon, who cried when he got fired and begged for his job. Now Sloppy Steve has been dumped like a dog by almost everyone. Too bad!” Trump said in a tweet. The Trump administration has been dealing with the fallout of the book since it hit the stores on Friday. “I work with the president and speak with him multiple times a week, this is a man, he didn’t become the president by accident,” Haley said.